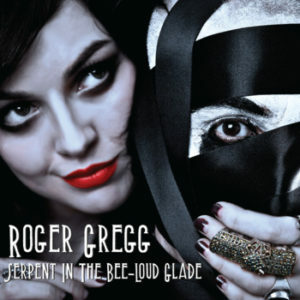 This week we take a departure from our usual programming to enjoy a thoroughly different poetic experience in Roger Gregg’s album Serpent in the Bee Loud Glade. Derived from his short-run theatre experience “The Bee Loud Glade Cabaret,” the studio album takes original lyrics as well as classic poems and dramatizes them in a way you have never heard poetry expressed before. There is music – oh yeah – but way beyond music, we have sound effects, smashing, crashing, pop grinding tunes soaring overtures and effects that re-imagine poetry for the 21st century. You’ve never heard anything quite like this, and I hope you enjoy our visit to the Bee Loud Glade, featuring originals by Roger as well as adaptations of Emily Dickinson, James Joyce, and W.B. Yeats. We follow this first-ever music set with an original audio drama (whew!) the Howl of the Mac Tire from Crazy Dog Audio Theatre‘s “Beyond the Back of Beyond” mini-series.